Periscope is one of the best things happening on social media right now. I’m just getting started, but I’ve looking forward to the possibilities! Pericope helps authors send their message into the world in a personal way. Who better to tell your story than you can? Who better to share your content or your passion? When people SEE you, they also see your authenticity. If people like you they’ll be interested in your books, your message, your heart. As of today I’ve done over a dozen broadcasts and I have 1.5K followers. I want my connections with readers to grow so currently thinking about what type of scopes I want to do, and what type of audience I want to grow. Followers are notified when I broadcast. They get an alert on their phone/device or they can see it on their Periscope screen. (The notifications are under the SETTINGS tab. You can turn them on or off there.) I’ve connected with old friends, and I’ve made new ones on Periscope. Some of you may know what I’m talking about. Others might not have any idea. No, I’m not submarining! For people to watch your videos they must have the periscope app. It’s owned by Twitter, so when you broadcast you can click a button and automatically have it go to all Twitter followers. Like Twitter you follow people, and people follow you. Unlike Twitter, Periscope doesn’t just stop with those who are following you. Periscope enables you to be discovered by new people as well. One of the best way for people to find you is when you are active on someone’s broadcast. If they like what you have to say they’ll follow you! The periscope community is great about supporting each other. When you broadcast you can see who is “attending.” Their user name/handle will pop up. Those watching your broadcast can ask questions or comment on your post. These comment bubbles float by, and if it’s busy it sometimes gets hard to read, but you can ask people to repeat their comments. Viewers can tap the screen to give you hearts. This shows they like what you’re saying. The more hearts you have the more others can see that you’re giving value to viewers. There is a limit to people who can comment. You may not be able to comment on the popular broadcasts, but you can still watch. Viewers also can “share” your scope with other Periscope users or on Twitter. A SHARE button will pop up when they watch a broadcast. 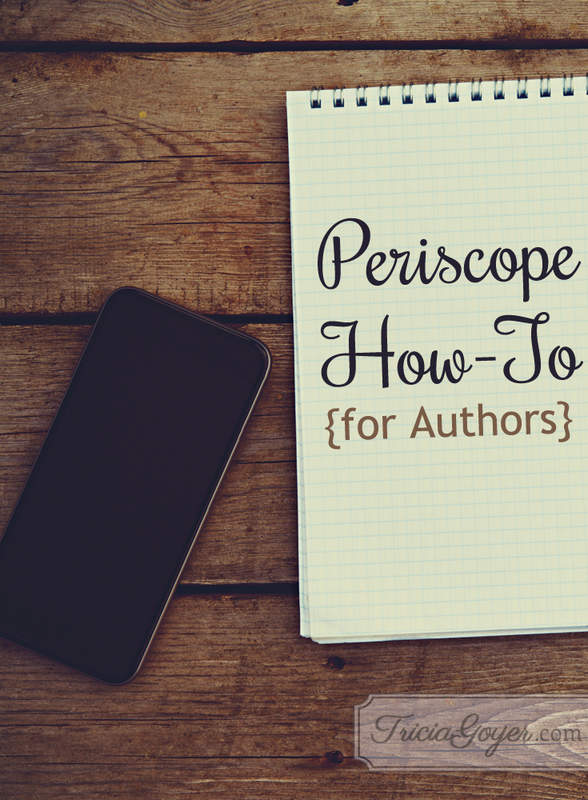 Why is Periscope awesome for authors? Periscope allows you to connect with fans in real time. In just a few short months it’s gained over 10 million users. A lot of people are excited about it! It allows you to reach readers in a fun and engaging way. It allows you to connect one-on-one with a community. Because of the engaging nature, many people are saying that Periscope is FAR more effective than e-blasts, websites and other marketing. When people connect with you personally they seem to be far more open to your products or services. I’ve personally bought books and products from people I’ve “connected” with on Periscope. Yes! Just jump in! Like someone I was watching said, “Your first 100 broadcasts will be junk … be okay with that!” The cool thing is that everyone is new on Periscope right now. We’re all learning as we go. How do you measure your success on Periscope? 1. People show up to your broadcasts. 3. You get lots of hearts. 4. Viewers connect with you on other platforms. Periscope can be a revenue stream. 1. Offer tips. I recently did a Periscope offering tips. Writers: How NOT to give up on the book of your heart. I shared tips, but I also talked about my book Prayers that Changed History. Think about what will value a reader … not just selling a book. Click here to see some of my recent Periscopes! 2. Show Behind the Scenes. What does your desk look like? How do you research? 3. Talk about the topic of your book. This can work for fiction or non-fiction. Share background, research, historical data, or any fun stories from the writing process. 4. Use the “private” group section. Connect with book clubs or readers. This makes them feel special. 5. Answer questions live—about writing or about your book topic. 6. Start a group. Author Kim Cash Tate has built an awesome Periscope audience of women benefiting each other. Her blog here and her private Facebook group. 7. Set up daily chats. I know homeschoolers who offer encouraged during the weekdays at 8 a.m. and authors who do devotions every morning at a specific time. 8. If you have an online store use promo codes. Give the codes during your scope and you’ll be able to watch the traffic. 9. Share LIVE events. Have someone hold your device for you while you speak or give a presentation. 10. Invite people to visit your website, blog or to sign up for your e-newsletter. Hold up cars to give the URLs, making it easier to write down. Business applications and community building is only limited to your imagination! What can you do with live video and real-time engagement? Thanks so much. I’ve had a lot of questions about this program and you answered them. I’m curious what you think is more beneficial, YouTube or Periscope. I’m sure Periscope is easier to use because it’s on your device. I really enjoy and benefit from your articles. Thanks for writing great stories and sharing your experience with newbies. Periscope IS much easier than Youtube. Also, there are a lot of people who enjoy watching, but don’t want to scope themselves–a ready made audience! Tricia, thank you so much for this! I was hearing about Periscope but didn’t really get it. I’m going to give it a go soon.